I hope you enjoy this FREE pattern! Please check out my fun PAID patterns as well! This pattern makes a fun flip toy for kids! Is it a Shark? Is it a Kangaroo? It’s BOTH, with a simple flip upside down. Two animals fused into one! 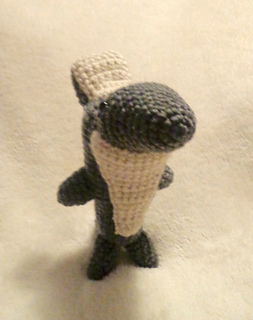 A quick and easy project to crochet, with pictures to help you with assembly. Your kids will “flip” for this unique little toy. 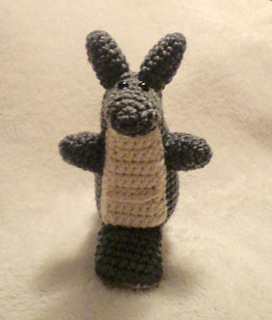 This is an advanced beginner amigurumi pattern, written in English, using US Standard crochet terms. Pattern purchase grants you the right to sell your finished toys. 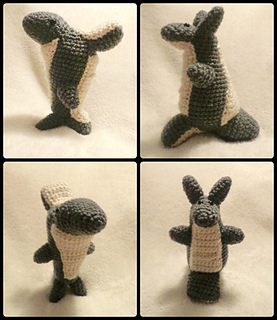 You can make him with just about any size, big or small, by varying the type of yarn or thread you use, and by varying your hook size. 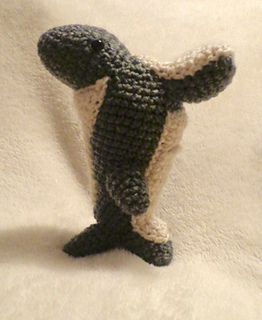 With Medium Worsted Weight Yarn and an F 3.75mm he comes out at around 7” tall. Gauge is not critical for this toy, but your fabric should not have holes or stuffing showing. 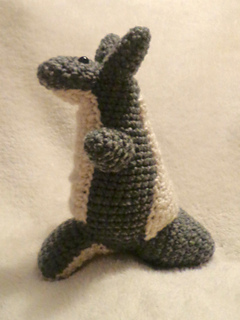 Grey (or any solid color), White (or any solid color), 4 – 8mm Safety eyes (or crochet the eyes or use puffy paint), Sewing needle, Scissors, Polyfill Stuffing, Stitch Marker, and a Sense of Humour.